The past few days have been insanity. 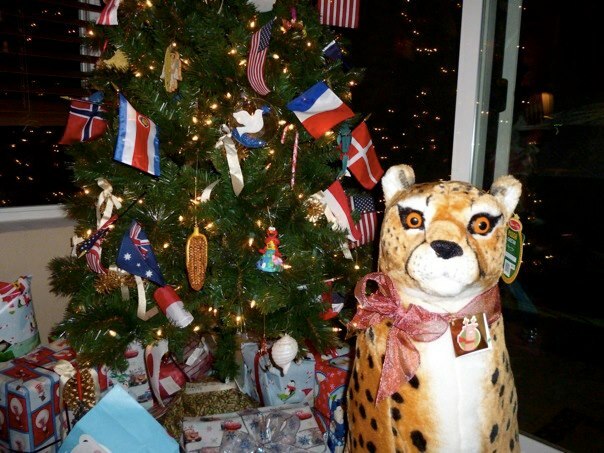 We popped down to Dalton for the big Dirty Santa Party. I received a duck call. And a bottle of Southern Comfort. I know it's better to give than receive, but I really want one of these... 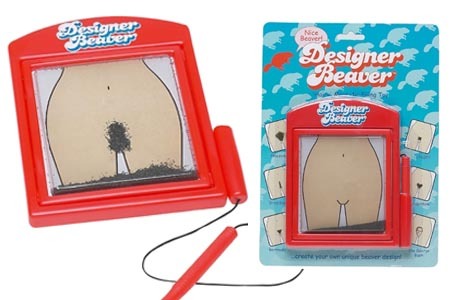 I may need to go ahead and purchase one for myself. Alternately, I could just get out the Nair, and... too much information, sorry. Sunday after breakfast, I came home to get Lola and wrap a ton of presents. I was coming down with something, so my biggest goal was to get to bed and sleep. I took three Benadryl to aid that effort. Getting out of bed on Christmas Eve morning was punishing. I got into the shower with the hope of waking up. Eventually, I got reasonably coherent, dragged myself out of the shower and got dressed. This is the actual possum that Lola had been chasing. They were standing inches from each other, neither knowing what to do next. I picked Lola up and deposited her in the back yard, then came back to capture the above photo. Note that the little fucker is HISSING at me. Anyway, I went back in and Lola had gone under our deck. Our deck is only about 2 feet tall and runs the length of the back of the house. I left Lola to hang out under the deck and chill while I loaded the car. I kept an eye on the possum in the side yard who was still hissing and stomping around in the leaves. Lola started barking again while I loaded the car. I came back to the deck and called her to come out. She stopped barking, but wouldn't budge. The possum had gone up into a tree and was out of sight good riddance. I ended up changing into old shorts and a t shirt, and crawled on my belly under the deck to come remove Lola forcibly. And that's when I saw the second possum huddled in a corner near the stairs of the deck. And Lola pacing by it, back and forth, giving it the stink eye. This was a different possum. It was light silvery gray, where the one in the side yard was more black. Also, possum #2 was not hissing, THANK JEBUS. 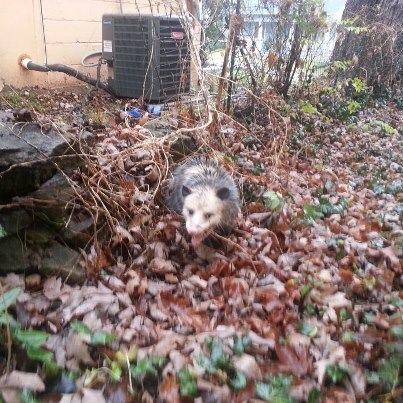 I don't mind snakes, spiders, bugs or vermin, but possums freak me the hell out. I managed to get Lola to come out from under the deck and hustled her into the house. I was covered in mud at that point, so another quick shower was required before getting on the road. After a quick stop in Dalton, we finally got there about 2:30 ET. We chilled out, I took a quick nap, told everyone about my excellent adventures. After dinner, we listened to some music, told some stories, I did some wrapping for Dad, and we crashed. 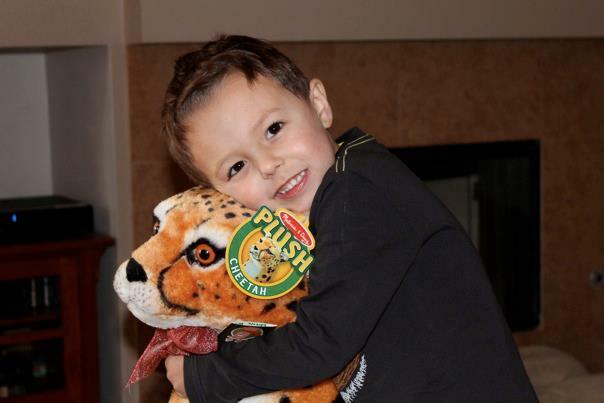 We got Henry, my four year old nephew, a large stuffed Cheetah and sent it to California. Finally around 2PM yesterday, we called out there to see if he liked it. As for me - I got all kinds of nice things. My favorites are a set of paring knives from Mom and Dad, and a very special umbrella from Matt. I'll take photos of that soon. But here's a hint. Ever seen Bladerunner? And now we're back in Nashville, and it's time to go back to work. Stay happy and possum free.